R. James Long is a contributing author, "Richard Fishacre", vol. 115, pp. 195-200. Book description: Medieval philosophy is the collective name given to the philosophies of thinkers who lived between the end of the Roman Empire, c. 400, and the beginning of the modern era, c. 1490. The philosophers profiled in DLB Volume 115 were involved in education, public life and ecclesiastical administration, and thus represent the various schools of thought that existed throughout this vast period. This volume offers much new information on these scholars, and fills the gap in available literature. The entries, containing biographies, bibliographies and beliefs of the philosophers, reflect the most recent developments in the field. R. James Long (1992). "Richard Fishacre," in Medieval Philosophers - Dictionary of Literary Biography, vol. 115, ed. Jeremiah Hackett, Detroit: Bruccoli Clark Layman, Inc., 1992, pp. 195-200. 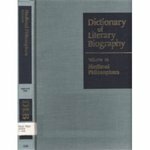 Hackett, Jeremiah and Long, R. James, "Medieval Philosophers - Dictionary of Literary Biography, vol. 115" (1992). Philosophy Faculty Book Gallery. 14.